Mutton Soup is a soup or stew made from the mutton which is a very healthy soup recipe and popular in South Indian state of Tamil Nadu. 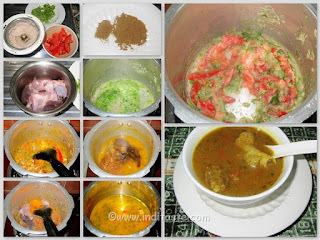 For my kids I make this mutton soup often, We call it as Mutton Uppu Saaru in Tamil. This recipe is like watery (not too much water) with mild spices. Here I added bone and the mutton pieces, you can add as your choice. My 4 yr old little one loves non veg, but not spicy so i do in this way. This Mutton soup is a good source of calcium and good for growing kids and Pregnant Women. Coriander powder 1 1/2 Tsp. Clean and wash the Mutton pieces. Grind the ginger ,garlic ,onion into paste and keep it aside. In a pressure cooker add the gingelly oil,when the oil is hot add the grind paste fry until the raw smells goes. Now add the chopped tomato,coriander leaves and fry it well. Add the mutton pieces and add all above powders. Fry the mutton pieces with the masala for 1 min then add enough water to it, close the lid and give 5 to 6 whistle or cook until the mutton became tender. * You can add half gingelly oil and half sunflower oil. * You can add 1 sliced green chilly also. * Pepper powder is also depends upon to your taste. While Serving with rice add 1 tsp ghee to the rice mash the rice well and then add the soup to it.